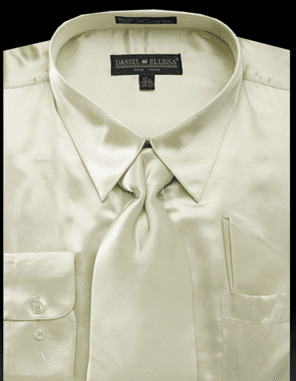 Get your style to pop like nothing else by wearing mens satin dress shirts by Daniel Ellissa. Any order style suit will look like you did something special to your style just by wearing a shiny style shirt under your suit jacket. This light olive color satin shirt will come just as the picture shown with the matching color satin tie set ready to make your style elevate right to where you want to be.